Toz, or salt in Turkish, is a word that has been attached to Libyan leader Moammar Gaddafi more than any other during his anti-USA years in the 1980s. Then, Gaddafi, and the pan-Arab nationalists, used it as a mantra: Toz fi Amreeka (America is nil). Toz got into Arabic from Turkish traders. The traders used it to avoid tax on rice imported into Ottoman Egypt by declaring their load as salt, or toz.o Now it is used by Arabs to refer to people or things that are insignificant or of no value. In the 16-17 February protests in Libya, Libyan demonstrators in Zentan chose this swear word, in particular, in their chants against Gaddafi. The word is common, but to use it against a dictator, in front of cameras, in a Libyan city, is indeed something. The protests spread quickly to Libyan cities against the most optimistic predictions, with the death toll, according to Al-Arabiya TV, reaching 19 people in eastern Libya alone. 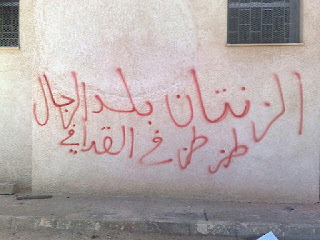 The protests in the eastern side of the Jamahiriyah were expected, especially in Benghazi and Al-Bayda. Al-Bayda is the hometown of King Sanussi, who was deposed by Gaddafi in his 1969 coup. Benghazi, on the other hand, has been a source of dissent for a long time against Gaddafi, possibly because he had favoured his Gaddaf al-Damm tribe in running the country and resisted power- and wealth-sharing. But the eruption of protests in Zentan, 75 miles south of Tripoli, according to Libyan opposition websites, reflects the strong feelings of Libyans about the "Guide". It is is also a very quick development, given that officially, 17 February was the first day of revolt, while in reality it was the second. Tripoli, Sirte and north-western Libya in general are known for being strongholds of Gaddafi and his regime. Therefore, Libyan protestors elsewhere will wait anxiously to see whether the protests will spill over to Tripoli or at least gain steam in surrounding cities such as Masrata and Sibrata. "But in the capital, traffic was moving as normal, banks and shops were open and there was no increased security presence." What we will have to wait for is to see whether the protests will evolve in size, with the participation of any opposition groups and unions, or larger numbers of university students. Libyans may move the protests quickly to the capital in a repetition of the Egyptian tactic. Or, they may continue to stoke up opposition in the east and south until the fire eventually gets to Tripoli, which is what the Tunisians have done. In either scenario, the Libyan intifada has set off. 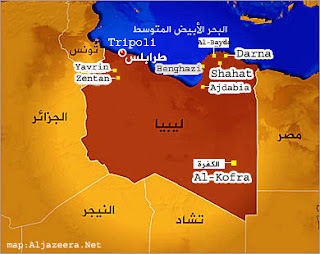 The fear of the security forces has been shattered in Tunisia and Egypt, many other Arab countries and now in Libya. The security forces, in those countries, eventually withdrew. And it is not going to be worse than it is, for the Libyans have finally said it out loud: Toz fil Gaddafi (Gaddafi is nil).